Take Meds Now is comprised of an experienced group of professional problem solvers that are passionate about improving medication compliance and safety for individuals. 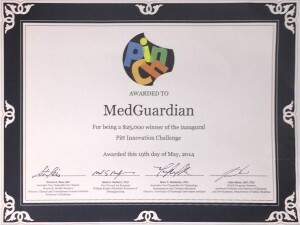 Take Meds Now is based upon our award-winning application, MedGuardian, which was an entry at the University of Pittsburgh School of Medicine “Pitt Innovation Challenge (PInCH)” in May of 2014. After the success of MedGuardian, a successful follow-up prototype was launched in 2015. The prototype was provided to focus groups across several major cities. These focus groups helped us fine tune our feature functionality, as well as led us to name the medication alert system as Take Meds Now. The Take Meds Now team is comprised of award winning communications scientists, business leaders in Healthcare, physicians, and technologists who are committed to developing services that meet the needs of patients, physicians, and other healthcare organizations. We have developed Take Meds Now as a system that can help you take your prescription medications correctly, help bridge the communications gap with your doctors, and provide tools for your family and friends to strengthen their place in your personal support system. In 2016, accidental deaths from prescription drugs hit a record high. With hundreds of thousands of deaths and emergency visits each year due to improper prescription drug usage, it is our goal to help reduce these numbers dramatically by bringing patients and physicians closer together. Patients will benefit from our medication alert system, and physicians can benefit from a detailed view of patient prescription adherence. We would love for you to join the Take Meds Now family. We know that Take Meds Now will provide you and your family with Peace of Mind.